When I first got the IBOX a couple of years ago, I was extremely frustrated by it. 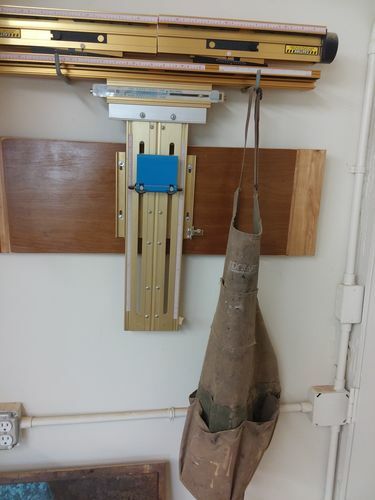 It’s a beautifully engineered tool, but getting it set up was a nightmare. Their KISS calibration and setting the guide fingers to fit the kerf from the test cut was difficult to perfect because too much of it was subjective. You turn the red knob until the fingers come together… but how tight?. 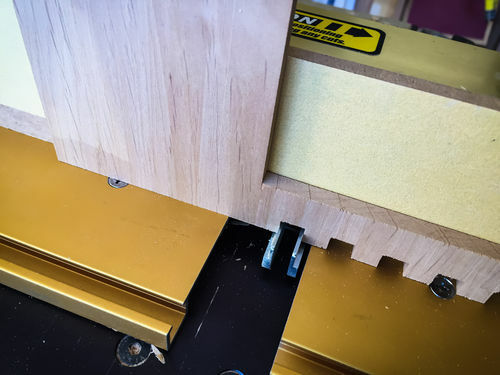 After making the test cut you open out the guide fingers to fit the kerf… but how tight? There was enough variance from one setup to another to mean that the first test cut was likely way off. Then, when it was, how much did the silver wheel need to be turned to get it right? I found myself making sometimes a half-dozen test cuts just to get close. Worst of all, some of those test cuts were actually poorer fitting than the previous one. In other words, I wasn’t even assured of getting closer with each try. 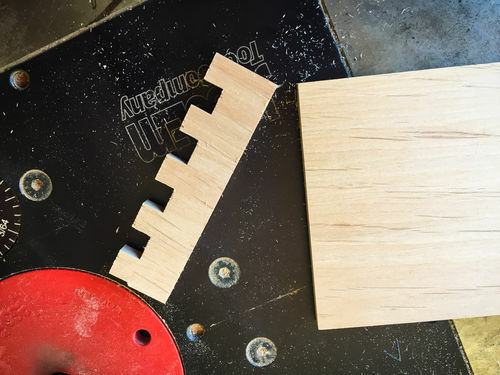 Well, once I wrapped my head around the jig and realized that there was only one factor that mattered — getting the fingers to fit the kerf — it became easy. 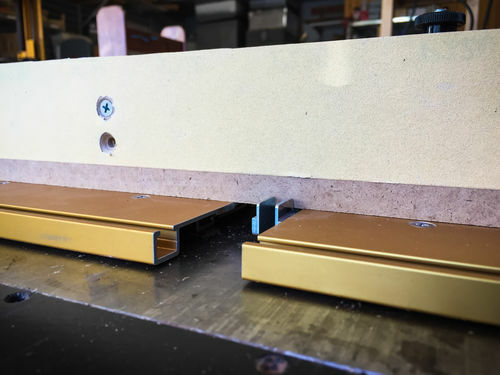 Fortunately the IBOX is a well engineered and manufactured product that is capable of being set up for perfect finger joints in just one pass. 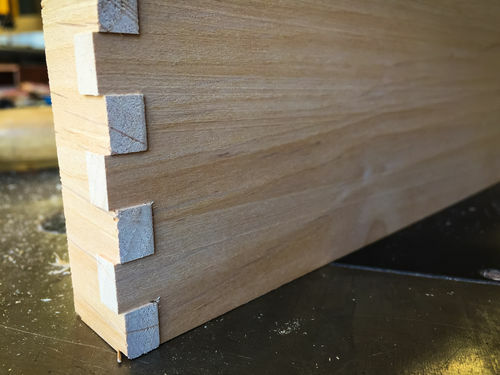 Note that this entry shows the process using a router bit. The steps would be identical on the table saw. I just prefer the router but you can use whichever you like. Follow along and you’ll be loving your IBOX again. For starters, I like to use an adhesive backed strip of 220 grit paper on the fence. It keeps the board from slipping which can ruin an entire project. Note that it only extends down to within about 1/2” of the bottom to avoid dulling the bit. Start with the standard instructions from Incra. First, center the allen head screw in the red knob’s window using the silver wheel. Next do the standard KISS procedure. Bring the guide fingers together using the red knob. Don’t worry about how tight, just get them close or touching. 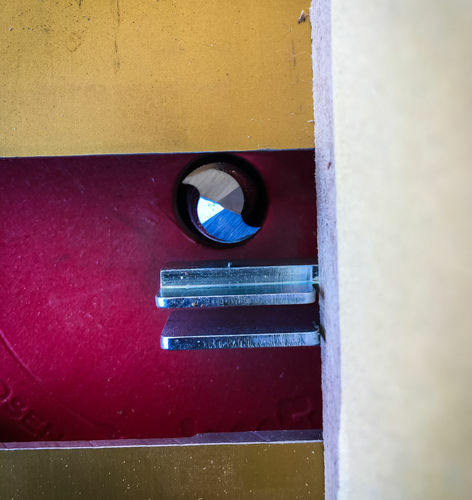 Back off at least 1/8” before making your first kerf cut using the red knob. Continue to follow the Incra directions for getting the guide fingers set to fit the kerf width. It’s a bit subjective, but the important thing is that the fit is firm. I like to set them so the kerf will just fit over the guide fingers and requires some pressure to seat it. That way I know it’s going to hold steady. Be sure to tighten the locking knob each time you adjust it so it’s locked firm, otherwise the adjustment will be off when you do lock it. Now, here’s where my process differs from theirs. Rather than assume the system has done its job and gotten everything set properly, I like to make a second cut and measure the size of the resulting finger. 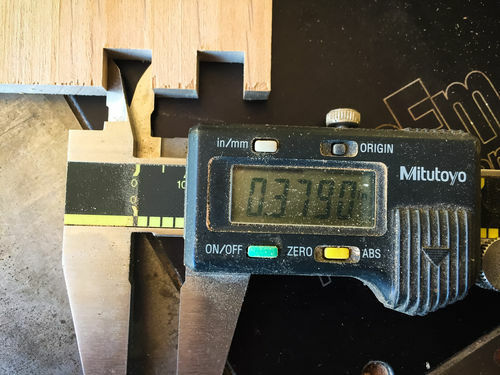 I also measure the width of the kerf rather than trust it exactly matches the size of the cutter. This accounts for variables like runout. 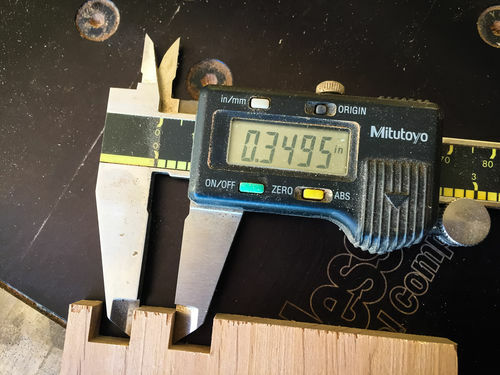 Note that the finger is 0.030” smaller than the kerf. You can adjust for this using the silver wheel. Clockwise increases the size of the finger and counterclockwise decreases it. Since the notches on the silver wheel represent approximately 0.0015” of adjustment for the finger size, you want to turn the silver wheel clockwise by 20 notches, or about 1 1/4 turn (there are 16 notches on the wheel). 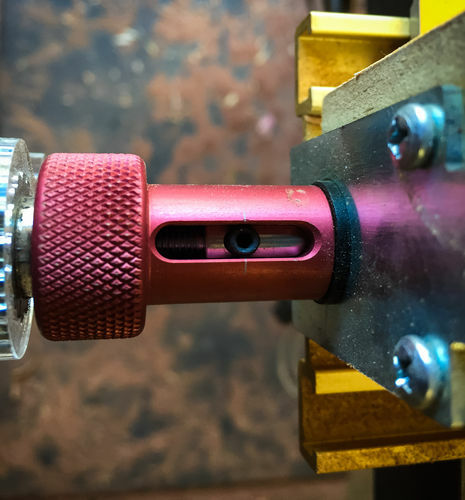 While that will get you a perfect fit, I find it’s one that’s a bit too tight for my liking, so I like to allow for about 0.004 to 0.006” slack and therefore will turn the wheel one revolution (16 notches times 0.0015” per notch equals approximately 0.024” increase in the finger size). 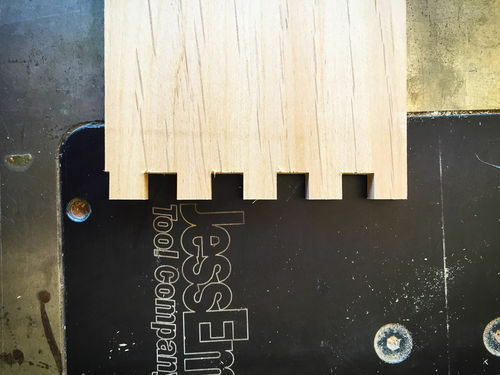 Now, trim off those test cuts and make a full set of cuts on the fresh edge. Then cut off the end leaving maybe 1/2” of solid wood holding the fingers. This is my trick for doing test cuts using just one board. It’s much easier than prepping two of them. 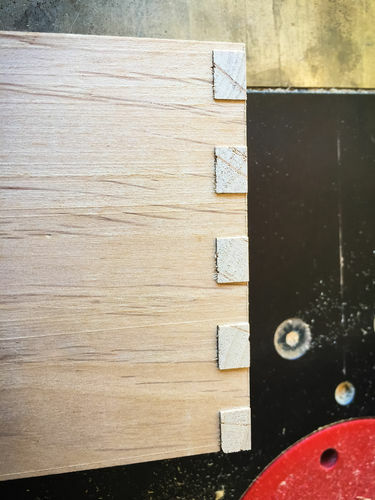 Use the cutoff piece just as you would normally to align the board for the second set of cuts. And here you have a perfectly fitting set of finger joints. 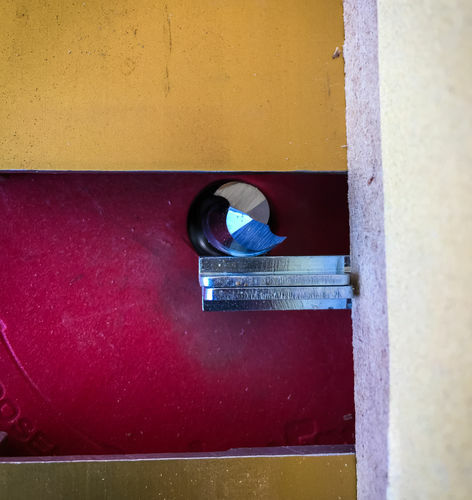 If you want to tweak the tightness and make another test cut, you can, but the beauty is that what you have now is exact, and your only adjustments will be to turn the silver wheel a notch or two clockwise to tighten, or counterclockwise to loosen the joint. And it only took you one test cut to get there. Will be pulling this up the next time I pull out my I-Box. Thanks! Thanks for posting, I will have to look this up when I get mine out again. I love the post! I time traveled back- INCRA. 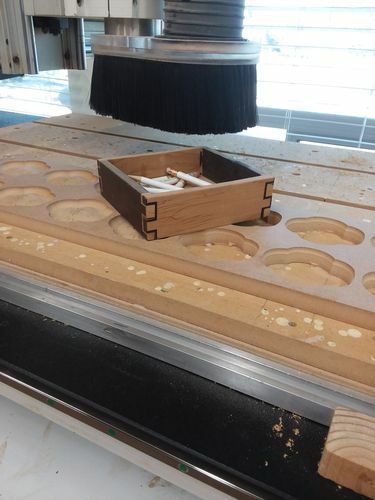 Here are some pics to add to the wonders on INCRA, but as you can see I went to CNC. IMO- INCRA was and is a very viable “truly” hands-on or machinist approach to woodworking. After inventing and refining his first two products, Chris Taylor founded the company in January 1987 and immediately introduced the Incra Positioning Jig and the INCRA Gauge. Before he started inventing woodworking tools full-time, Chris was an electrical engineer and serious woodworker. INCRA has been a great help to many woodworkers with continuous creative innovation since 1986. Thanks for posting. Just started using my new I-Box for the first time time today. Initially joints were really loose by about 0.020 Using your method only took two adjustments of the silver knob to get a perfect fit (0.005” gap). Thank you so much for letting me know, Joel. I really appreciate knowing it helped. 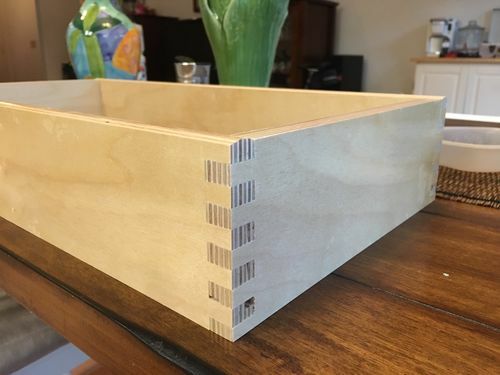 Here is my first completed drawer box. I am really happy with how it came out. I used prefinished baltic birch sides so I had to sand the box joint ends flush using a scrap piece to avoid sanding off the finish on the mating piece. That resulted in the ends not being exactly flush when I put the drawer together but close enough. I cut the joints to have a 5 mil gap. When I was gluing it up the joints went together nicely during the dry fit, but once I put glue on them I had to use a mallet and lots of clamping pressure to get them tight. I was afraid of that happening so I ran down to Rckler to get some Tightbond II Extend, Glad I did because I needed the extra open time.